I didn’t win the race; I won my race. Lydia and I ran the B.A.A. 5K along with 6,000+ other runners, our second race this year and my second race ever. On the train ride back to our car at 9:30am, having done what we each set out to do — Lydia improved her time and I ran the whole route without walking — Jimmy asked me if this race felt different than the first. 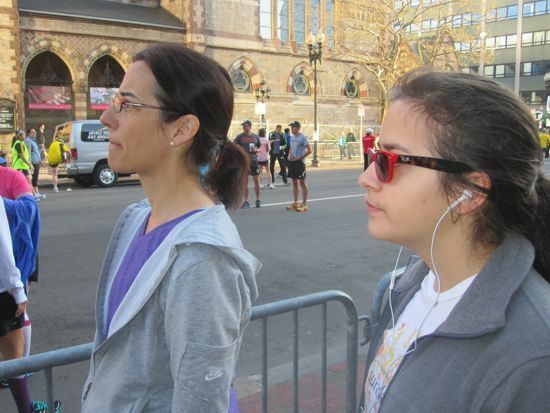 Before the race, Jane and Lydia contemplate the finish line. I enjoyed this race more. 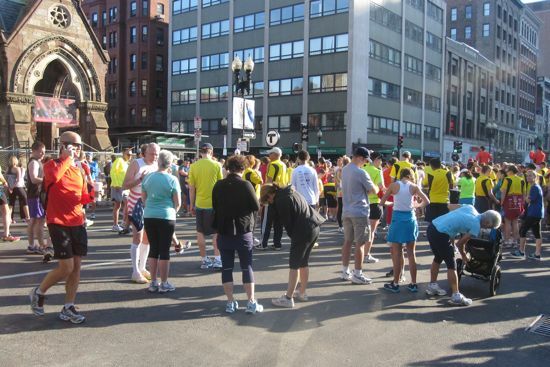 There was only one hilly patch (near the State House), and my mental resources therefore were not focused on the stamina and positive self-talk needed to get up yet another one of the several hills in the South Boston 5K. My mind was free to think other thoughts. After the start and as we were trotting up Boylston Street, I noticed a lot of women running past me in lululemon tanks with the ruffle down the back and several sporting lululemon running skirts. 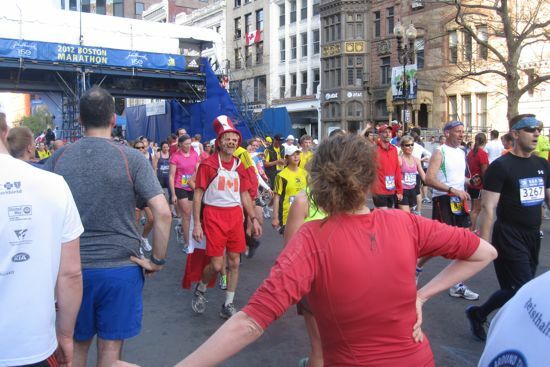 What, by the way, is up with skirts on runners? Do they hide something? Does wearing one communicate a dichotomy in identity? I’m pretty; I’m strong. What’s wrong with simply I’m strong? Lineup gathers on Boylston Street in front of the Boston Public Library. Speaking of sartorial runners, before Lydia surged ahead I pointed her attention to another mother-and-daughter pair near us who were in full makeup, foundation included, with hair carefully blown dry. All those overt beauties ran past me along with many other runners who were fast starters. My ego felt vulnerable in the first few blocks. I was determined to pace myself, and yet it’s a little disheartening to be passed by just about everyone. I had a talk with myself and bolstered the self-esteem. At the first water station near Park Street, I grabbed a cup from a volunteer. By this point I felt happy and looked ahead and around at my fellow humans, all bobbing together, some talking, and I wondered if non-domesticated creatures (like ants and fish and wild horses) had ways to play some version of sports together. Do they ever scurry or run simply to scurry and run? To be part of a human endeavor like this seemed to say something about our capabilities beyond survival and purpose. Athletics may in some way be like art. I did see a lone woman, in her B.A.A. 5K yellow race shirt (I didn’t wear mine), cut a big corner off the official route by running through the Common instead of around it. So much for the herd. Down Beacon Street and after the State House, I mulled over a remark Lydia had made when I had said I wasn’t in competition with anyone. “But Mom, you are. You’re in a race.” (Touché, daughter.) Yet I doubted I was fit enough to win anything. Ahead of me, I saw an old couple — a man and woman in their 70s — running vigorously and steadily together, and I decided to make them my pace car. I made a mental note to tell Lydia that we need to run one 5K every month to stay on track. I saw a middle-aged fat guy running with his 20-something fit son. The son was coaching his dad and, in doing so, holding himself back. I wanted both to praise the young runner and say to him, Go! Your father will be okay. I suppose on another day the son will have his turn. One of the 4,700 runners who crossed the finish line in front of me. A costume may help. The finish gate — the same one that the Boston Marathoners would cross on the following day — was in sight. I passed my pace couple. I straightened my body, like there was a string from deep inside my gut, vertically through my center, and out through the top of my head pulling me up, and I quickened my pace. I passed some skirt-wearers and some compression-sock wearers. I knew Lydia was way ahead of me, and I hoped she beat her own time. I leaped past walkers. I almost, almost, almost felt the runner’s high that my sister Sally had described to me a week earlier on Easter Sunday, but not quite. There was no euphoria, just the pleasure in I did it, I did it, I did it. After the race, Jane and Lydia sport their participants' medals. Thanks to Jimmy for taking photographs and Grace for coming along. Always enjoy your posts, Jane! You could use the “After the race” photo as your portrait. No need to always have your head turned. Thanks, Bob. 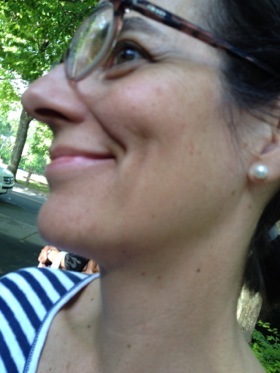 And about the turned head: it’s a deliberate pose of modesty to balance out my taking of the stage here. I get your point, though. i’m doing my first 5k the first weekend in may and you’ve given me some great tips here yay! Good luck. 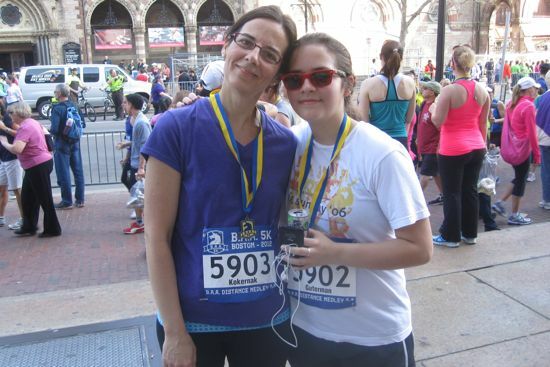 It’s really exciting to find out what you can do, and to be among so many other runners! Congratulations on finishing your second race! I’m seeing more of those skirts on the trails, it’s odd, but I get that some women need to feel frilly and if that helps them get out on the pavement then so be it. My running mantra is “I’m moving faster than a couch potato” and I just keep trudging along, one foot in front of the other. I finished my first 5K last October and hope to keep running not to race anyone, but to keep moving as long as I possibly can. I admire those 70+ ladies on the trail, they give me hope and something to aspire to. I’m happy to see you and your daughter are running together, that will be something she remembers for a long time. That’s a good point about how those skirts may motivate some runners out on the pavement. Admittedly, it may be that I personally don’t feel as though I’ve ‘earned’ some sort of costume yet for running — am I legit enough? When I feel ready, I may not tend to a lululemon skirt, but perhaps some great shoes or top are in my future. The next time I run I’m going to meditate on the “moving faster than a couch potato” remark. I channeled my inner Jane today and ran up Suicide Hill and Heartbreak Hill on my usual trail. First time I ran up both in the same run! Take THAT couch potatoes! Oh, and a cute top or some killer shoes would be a great reward for reaching a milestone. Go for it! I need to channel my inner Jane. So hard to do as semester is wrapping up. We are signing up for a 5K later in May; that should provide some spark. Will report back on any sartorial additions for running. I did this race too! Gorgeous recap. I haven’t yet decided how I feel about running skirts. At the moment, I’m leaning towards their being outlawed. But I guess they have a place. I am trying to soften my position on the running skirts. It’s a diverse world, I remind myself.